I do not write many raw food recipes but lately I’ve been experimenting a lot with raw snacks. Especially since I love my Larabars so much, I thought it would probably be much cheaper to start making my own. I’m very close to perfecting a couple of the snack bars, but during this time I also came up with a few of my own concoctions. 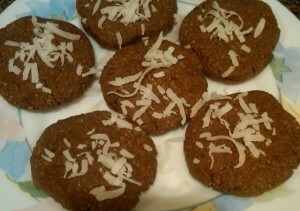 My recipe below is my raw version of chocolate cookies. Notice there is no added sugar in this recipe. The cookies are sweetened with the banana and dates. Enjoy my recipe below for Chocolate Cookies. These are pretty healthy and make for a great snack! Place all ingredients in a food processor and process for a minute. Once combined, take ‘dough’ and refrigerate for 30 minutes. Take the chilled dough and with two tablespoons worth form into a ball and then lightly pat to shape a round cookie. Place on a plate and repeat with the remainder of the dough. Tip: make a batch of these cookies and freeze them up for a quick treat anytime! This entry was posted on Thursday, March 17th, 2011 at 12:33 pm and is filed under Chocolate Corner.